From February 1-April 30, 2009, Stampin' Up! is giving away free Idea Book & Catalogue. To receive a free Spring-Summer 2009 Idea Book & Catalogue, you must order online. There is no minimum order amount required, so anyone can take advantage of this offer. I saw this tag done over at SCS during Christmas and thought I try a Valentine one. A shorter version. What do you think? I like it a lot. Very simple and nice. Each tag measures 2" x 3 1/2" and the total length of the tag is 10" scored at every 2". Sale-A-Bration Time Is Coming Soon! Sale-a-bration is my absolute favourite time of year!!! Why you might ask? …it’s because of all the FREE STAMPS and ACCESSORIES I get to give away for FREE! CUSTOMERS-For each $60 you spend, you will receive one of the above items free! How fun is that?! You can click here to see full flyer! Here are some samples made from the Sale-a-bration sets. Thank you all for participating and well wishes for my birthday. So here the winners for the blog candy. Happy Birthday and Happy New Year to you and your family, Deanna! Congratulations, ladies! Please, email me (mrstam007@gmail.com) for your snail mail and I'll send the goodies out as soon as possible. I had a great birthday today. Had a party at my sister's. We had Chinese New Year dinner and a cake for my birthday. Here is a photo of my kids and my niece (the one in blue dress) and the yummy mango cake. We wore Chinese outfit to celebrate Chinese New Year. My children gave me this cute slippers. Love the colours, the swirly and the flowers. This is from a friend and neighbor. She made this cute little card to go with the candle holder. cute little candle holder. I went to a bridal shower tonight. It was a surprised shower but I was late trying to finished up the cards. I made 20 "Thank You" cards to give to the bride-to-be and the little box next to it was just for fun. Wouldn't it be nice as a wedding favour? I'm making some cards for a friend to give away. These are "Thinking of You" cards. I also made different birthday cards and will be sending them to her when I'm done. Hope she likes them. This one I CASEd from the new Spring/Summer 2009 Catalogue on page 117. Hello, everyone! I'm so excited! I have an Etsy shop. Please visit the shop and tell me what you think. I don't have a lot of stuff to sell yet but it is a working progress. This card is list on my Etsy shop. shop online 24/7 with me! The new Idea Book and Catalog of course! Isn't it pretty? You can start ordering from the new catalog today! Click here to order online. Want to browse through all the new products? Click here to download. And don't forget you get a chance to win a stamp set of the month. Every $25 you spend gets your name in a draw for the stamp set. How about a blog candy! To celebrate my birthday this coming weekend and Chinese New Year coming January 26 I would like to give three blog candies away. These three candies are all almost the same except the papers. Leave a comment on this post and I'll draw 3 names on January 24 at 9pm western time. Good luck! Have a good day! 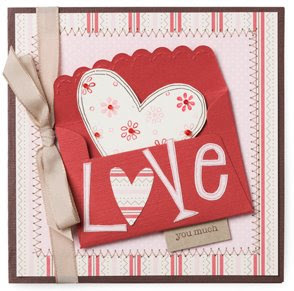 What better time of year is there to express your love and appreciation to your family and friends than Valentine's Day? 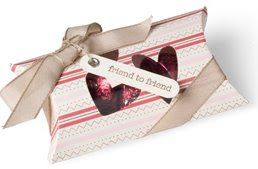 In this class you'll create four love & friendship card, four 3"x3" friendship notes and 9 tags that can be use when packaging up Valentine's treats for your kids, teacher, friends &/or co-workers. The whole collection is packaged in this one-of-a-kind Stationary Purse. If you want this class in the mail the cost will be $30 shipping including. All precut consumable materials in this kit and instructions email to you after you purchase the kit. You need to provide your own stamps, adhesive, inks, blender pen and punches. This class is not available for purchase to other Stampin'Up! Demonstrator. If you are a demonstrator and are interested in this class , click on the DEMO TO DEMO icon to the right to purchase one. Hope to see you at my upcoming class! Punches: Scallop Circle punch, Scallop Edge punch, 1/8" hand held circle punch, 1/16" hand held punch, Tag corner punch, Designer label punch, Heart to Heart punch. Hello everyone! 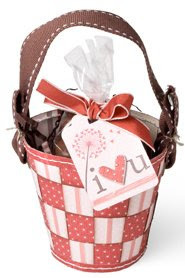 These are little treat holders for Valentine. I can put a mini kit kat in there. Aren't they cute? It reminds me of a little purse. I think little girls would love. Don't forget the retired list retires January 18, 2009. You can download the list to see what you need by clicking on the links. Made this "thank you" card with all retired products. I have enough to make 10 and a friend made 2 for herself. We had fun stamping together. I'm trying to clean out my stamping space and wherever I leave my stamping stuff. i.e all around the house. I took most of the space in the house and it is time to get rid of somethings. How about a blog candy? I just have to get organize and take a picture of the blog candy. I'm not sure when yet but maybe sometime next week. Come and visit often. Your comment are always welcome! Hello, everyone! I had a lot of people asking questions on how I adhere the accordion flower. So, I made a tutorial. Hope this helps. It is pretty easy to make . Score a piece of 1"x12" piece of designer paper at 1/4". Fold the score lines like an accordion. Put sticky strip on one end of the designer paper. This is how it looks like when the ends are tape together. This is how it look like when you push it down and in towards the middle. It will pop back up like the previous photo when you let it go. Punch out a 3/4" circle piece of card stock and add Crystal Effect. ETA: You can also use glue dots or hot glue to adhere the circle piece to the flower. Put the accordion flower onto the 3/4" circle piece, push it in so the hole in the middle is small, and hold the flower for at least 1 minute or until the CE is dry. Make sure the flower is even and round all around. This is how it looks on the back. 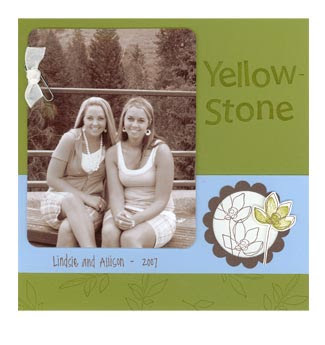 For the front I stamped a flower image, cut it out and adhere to a piece of Brocade Blue circle cardstock. I pierced the edges with a piercing tool. Then, I adhere the top piece onto the flower with Crystal Effect. This keeps the accordion stay together and very sturdy. Finish product. I made another one with a heart button I found in my stash of buttons. 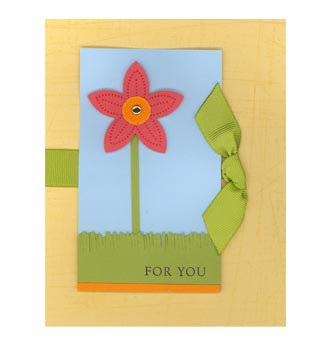 If you want to see this flower on a card click here or scroll to the previous post. Have fun creating your own accordion flower. I received my 2009 Sale-A-Bration complimentary catalogue this week (one of the perks for being a demo). I saw a card that have the accordion flower on it and thought I give it a try. Pretty easy. There is an instruction in the catalogue on how to make this. Get a SAB catalogue from me or from your demo then you too can make one. Sale-A-Bration starts Feb. 1-March 31, 2009. If you are new to stamping or Stampin'Up! 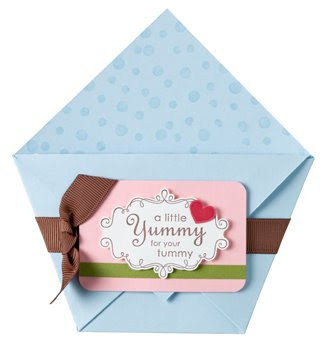 , Sale-A-Bration is an exciting time for all stampers and scrapbookers alike. You get FREE stamps! There are 3 ways you can get Sale-A-Bration items for FREE. 1.With every $60 you spend you get to choose a FREE stamp set from the SAB catalogue... there is no limit on how many sets you can get. 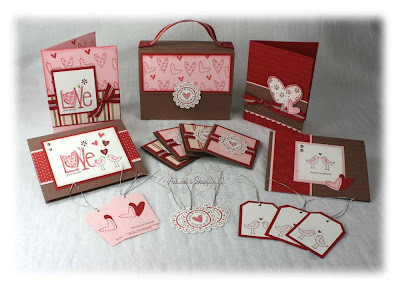 There are 4 sets and one Designer Series Paper for you to choose from for FREE. 2.When you host a workshop of at least $350, you'll receive a FREE Sale-A-Bration item in addition to our generous hostess benefits! 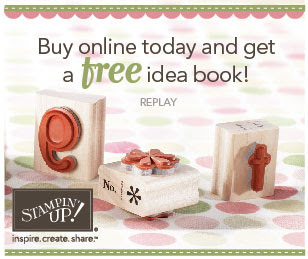 3.Sign up to become a demonstrator during Sale-A-Bration and select any set (value up to $56.95) from the Spring-Summer 2009 Idea Book & Catalogue FREE! O.K I know I said FREE a lot because who doesn't like FREE stamps? I do! Watch out for the SAB catalogue on my side bar coming out soon! I made this card for the color challenge over at SCS. These are colors I rarely use especially the Brilliant Blue. This is my first time using it. Interesting color. For a limited time only I am offering you a chance to win a FREE stamp set every month until the end of the 2009 year. To qualify all you have to do is place a minimum $25 (before tax, shipping and handling) purchase order through my website, email or phone one in to me. I will then put your name into the proverbial hat for your chance to win. One purchase equals one entry. You can also get entries by hosting workshops with me. With great stamps and a chance to win every time you make a purchase you just can’t lose! Take a look at this month's giveaway! Happy New Year everyone! Wishing you all a bright and prosperous 2009! Just want to share with you a New Year blessing! I'm an aunt again! Baby Emma was born at 6am weighing at 7lbs 6oz. She is cute and heavy of all of my other nieces and nephews. Mom and baby are doing well. We went to visit them in the hospital today. Here is a picture of Emma.